Are you storing flammables or combustibles safely? Does your storage solution provide your personnel and investments with a secure work environment? Flammable storage lockers by US Chemical Storage are designed to keep your flammables, combustibles and other hazardous materials compliant, while keeping your personnel and investments safe from hazardous situations. Flammables and combustibles can be very dangerous, therefore proper storage practices are necessary. Customize your flammable storage locker to meet your exact specifications with US Chemical Storage. Our flammable storage lockers offer a 2-hour fire-rated or 4-hour fire-rated construction for complete security. Our flammable storage lockers meet NFPA regulations, and comply with EPA and OSHA requirements. Store chemicals inside or nearby your facility. Explosion proof or non-explosion proof accessories available. Turnkey installation (design, delivery, install) available. Climate control from -20°F to over 175°F. Storage for flammables, combustibles, corrosives. Mechanical ventilation, alarms, sensors, liquid level detectors available. Meets NFPA, OSHA, & EPA regulations. Flammable storage lockers by US Chemical Storage meets NFPA regulations. When storing flammable chemical storage, it is important to remain compliant, while keeping your chemical storage managed properly. Flammable chemical storage can be very volatile, leading to hazardous situations. Whether the flammable chemical storage is a liquid, solid, or semi-solid it needs to be maintained properly. 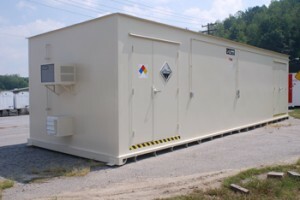 US Chemical Storage offers an wide variety of flammable chemical storage accessories including mechanical ventilation, passive ventilation, explosion proof lighting, explosion proof ventilation, and more, for your flammable chemical storage needs. Maintaining your flammable chemical storage with a fire-rated chemical storage locker will provide superior protection to your facility, personnel and investments. Make sure to maintain your flammable chemical storage in one of our extremely strong and secure, fully compliant, and 100% customizable fire-rated chemical storage lockers.